DESCRIPTION: This is a very powerful hostile monster, approach with caution! Killing this monster will yield great monetary and magical rewards to the team, but it should not be confronted alone. Baron Nashor is a neutral monster that appears on the map Summoner's Rift. The many neutral monsters on the Fields of Justice are constructs inspired by real creatures from Runeterra. The Baron Nashor you see on the map is actually an incomplete facsimile of the true Baron Nashor, who is now the subject of myth and legend. The story goes that Baron Nashor was a ferocious worm that ruled the Serpentine River, which flows through Summoner’s Rift. He was such a fearsome and powerful beast that even the armies of Demacia and Noxus steered clear of the river, unwilling to chance an encounter with the Baron. 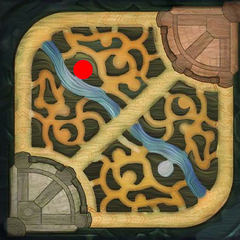 When Summoner’s Rift was constructed, the Baron vanished, leaving no conclusive evidence as to where he went or why he left in the first place. Obviously the rumor-mill has churned out many explanations, but all we know for sure is that the Senior Arcane Architect for the Summoner’s Rift arena was said to have crafted the version you see today from no more than a molted scale and interviews with those who had seen the beast and lived. SPAWNS: It spawns at 20:00, and it respawns 7 minutes after slain. - The whole team who landed the last hit gets 300 gold and 600 experience. - The champ that landed the last hit gets 25 gold. - Every alive member of the team gains the Hand of Baron buff, which grants Attack Damage, Ability Power, improved Recall and a minion aura. These stats are summarized, and they do repeat some information that is shown above. *Crowd Control Immunity: (Innate): Baron Nashor is rendered immune to any form of crowd control. *Void Corruption: (Innate): Baron Nashor is surrounded by an aura of destruction. If angered, he deals magic damage and applies a a stack of corrosion to a nearby champion with the least amount of corruption stacks. *Voracious Corrosion: Applies a stacking debuff that reduces target's armor and magic resist by 0.5. Stacks upto 100 times for a total of 50 armor and magic resist reduction. *Sweeping Blow: Knocks all champions away from the Baron by 600 range. This range is equivalent to the distance between the Baron and the entrance to his locale. *Tentacle Knockup: Similar to Cho'Gath's Rupture which knocks up the target high in the air, approximately the height of Baron himself. A small circle appears which seems to have a tentacle charging power up to unleash and knock all those who stand in the AoE. *Acid Shot: Baron spits acid in a straight line, capable of leaving the pit. This deals magic damage and adds a large number of corrosion stacks to each target hit. *Rear attacks: Baron does not like being hit in the back. People standing behind Baron and outside the pit are hit by an AOE spike attack that deals physical damage to all targets hit and stuns them for 1 second. *Acid Pool: Baron spits out 3 green round pools in a cone front of him. This deals magic damage to all targets hit and creates slowing field. *Baron's Gaze/Damage reduction: Baron reduces all damage to him by 50% from the champion he attacks. This debuff lasts for 15 seconds, thus enabling this debuff. Additionally, Baron Nashor has the passive ability to knock back any wards and Teemo's Noxious Trap being placed too close to its body for a short range. Noxious Traps are pushed far enough away so that their splash damage does not reach Baron Nashor. Wards are pushed away so that they are not placed inside Baron Nashor; otherwise, the ward would be untargetable and unable to be destroyed without first killing Baron Nashor. Zyra can plant 9000 seeds to solo baron in 2 sec. 795711 LeeSinDra Zyra can plant 9000 seeds to solo baron in 2 sec. Jax can rush Wriggle's Lantern, Ninja Tabi, Hextech Gunblade, Guinsoo's Rageblade to solo kill Baron Nashor. 631392 TwitcherBrain [[Jax]] can rush [[Wriggle's Lantern]], [[Ninja Tabi]], [[Hextech Gunblade]], [[Guinsoo's Rageblade]] to solo kill Baron Nashor.